Autumn is just around the corner now and the kids are about to return to school. This year’s summer holidays are a distant happy memory and our thoughts turn once again to work, life at home, open fires and those warming autumnal dinners. This gloriously colourful time of year, with its falling leaves and turning colours, shorter days and longer nights, encourages us to spend more and more time at home and what better time to make your home feel more cosy, intimate, warm and inviting, with new exterior and interior lighting. Autumn is all about layering, not only in our clothing and bedding but in our lighting too. Creating warmth with your interior lighting will give your home a truly inviting feel as you welcome your guests and family members in from the cold and the dark. 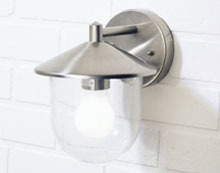 Exterior home lighting is important as the nights draw in for both safety and security. Wired to movement sensors, they will automatically switch on when movement is detected. This arrangement is doubly advantageous since on the one hand, your outdoor lights will safely guide you in from driveway to garage and front door and on the other, they will act as a deterrent to any would-be intruder, providing safety and security for your home and family. The number and style of your exterior lights, will largely depend upon the size of your entrance way and your home’s architectural design. If you have a long driveway, you may wish to install your own street lighting in the form of lamp Posts, wall lights and lanterns. If you don’t have quite so far to travel from roadside to porchway, you may wish to mark your entrance with two pedestal mounted lanterns. Placed at either side of your driveway and fitted with motion sensors they will clearly illuminate your driveway entrance, assisting with parking and aiding safe transit to your front door. 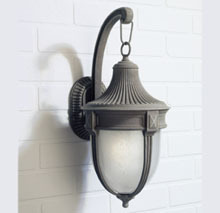 In the porchway itself a large wall or ceiling mounted lantern will help with the struggle to find keys whilst wrestling with the shopping. We stock a huge range of external lighting and PIR (passive infra-red) products with ranges from Elstead, Impex, Kyoto and Limehouse lighting. Once inside the home, there are many lighting options open to you. From overhead ceiling mounted lights to pendant lighting, from wall lights to task lighting and from table lamps to floor lighting, Inspiring Lights has a vast range of interior lights to meet all of your interior lighting requirements and create a cosy autumn glow. Inspiring lights offer an eclectic range of table lamps constructed of every conceivable material. 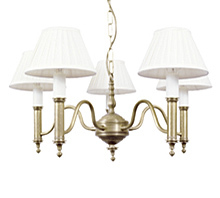 There are metal table lamps, wooden table lamps, ornate painted table lamps and decorative crystal table lamps. 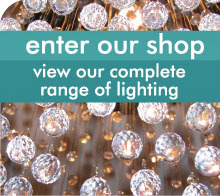 Our range features such designers as Rochamp, Newtra, Metal Lux and Kansa Lighting amongst others. Each of these designers has their own take on the table lamp, some choosing to stick fairly closely to the anglepoise design with metal while others embrace glass and wood in all its shades and fashions. Into the lounge or dining room now and you will probably find a centrally located ceiling mounted pendant light fitting, maybe even two or three, depending on the size of the room. These are great light sources as from here, in the centre of the room they will cast the most light, filling the room with warmth and brightness. Lamp shades will help to distribute the light properly, redirecting it from ceiling to floor and with so many shades to choose from, in so many different sizes and shapes, any look you wish to create can be finished off and complimented with the right lamp shade. 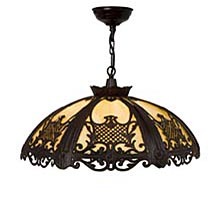 Pendant Light Shades – click here to start shopping! Crystal lights in the form of chandeliers, table and wall lights bring that extra sparkle to a room, particularly one that catches the sunlight. In this case, rainbow patterns are sent around the room and it is not uncommon to see every colour in the spectrum dancing upon your walls. This is particularly effective if your walls are a lightly coloured cream or white, allowing the brilliance of the reds, blues, greens and yellows to be seen in all their glory. Interior lanterns make wonderful additions to your home décor, particularly if you have high ceilings. They make ideal statement pieces in large entrance halls and work very well in stairwells since most models come with variable length suspension cords or chains. This flexibility allows you to decide how far from the ceiling, your lantern hangs. Traditional hanging lanterns will follow the Victorian/Edwardian style and as such, go extremely well in homes dating back to this era. But their appeal and design are not limited to this period, there are many lanterns that are equally at home in more modern houses. Lanterns are very often used in commercial settings, in quality clothing stores, jewellers and in fine restaurants. They present a grand image that harks back to the days of style and quality of service.